You need insulation in your home to provide resistance to heat flow. The more heat flow resistance your insulation provides, the lower your heating and cooling cost. Heat flows naturally from a warmer to a cooler space. In the winter, this heat flow moves directly from all heated living spaces to adjacent unheated attics, garages, basements, and even to the outdoors. Heat flow can also move indirectly through interior ceilings, walls, and floors - wherever there is a difference in temperature. 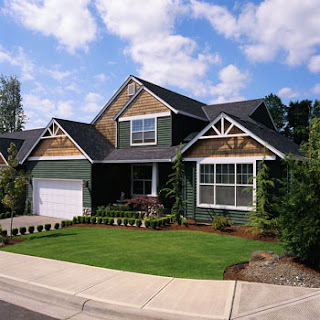 During the cooling season, heat flows from the outdoors to the interior of a house. To maintain comfort, the heat loss in the winter must be replaced by your heating system and the heat gained in the summer must be removed by your cooling system. Properly insulating your home will decrease this heat flow by providing and effective resistance to the heat flow. Insulation is rated in terms of thermal resistance, called R-value, which indicates the resistance to heat flow. The higher the R-value, the greater the insulating effectiveness.The R-value of thermal insulation depends on the type of material, its thickness, and its density. In calculating the R-value of a multi-layered installation, the R-values of the individual layers are added. Insulation placed between joists, rafters, and studs does not retard heat flow through those joists or studs. This heat flow is called thermal bridging. So, the overall R-value of a wall or ceiling will be somewhat different from the R-value of the insulation itself. That is why it is important that attic insulation cover the tops of the joist and that is also why we often recommend the use of insulative sheathing on walls. The short-circuiting through metal framing is much greater that that through wood-framed walls; sometimes the insulated metal wall's overall R-value can be as low as half the insulation's R-value. Some types of insulation require professional installation, and others you can install yourself. You should consider the several forms of insulation available, their R-values, and the thickness needed. The type of insulation you use will be determined by the nature of the spaces in the house that you plan to insulate. For example, since you cannot conveniently "pour" insulation into an overhead space, blankets, spray-foam, board products, or reflective systems are used between the joists of an unfinished basement ceiling. The most economical way to fill closed cavities in finished walls is with blown-in insulation applied with pneumatic equipment or with sprayed-in-place foam insulation. The different forms of insulation can be used together. 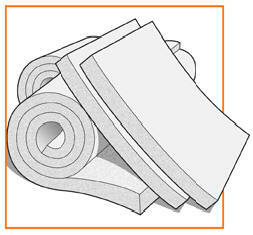 For example, you can add batt or roll insulation over loose-fill insulation, or vise-versa. Usually, material of higher density (weight per unit volume) should not be placed on top of lower density insulation that is easily compressed. Doing so will reduce the thickness of the material underneath and thereby lower its R-value. There is one exception to this rule: When attic temperatures drop below 0 degrees F, some low-density, fiberglass, loose-fill insulation installations may allow air to circulate between the top of your ceiling and the attic, decreasing the effectiveness of the insulation. You can eliminate this air circulation by covering the low-density, loose-fill insulation with a blanket insulation product or with a higher density loose-fill insulation. Blankets, in the form of batts or rolls, are flexible products made from mineral fibers, including fiberglass or rock wool. They are available in widths suited to standard spacing of wall studs and attic or floor joists. They must be hand-cut and trimmed to fit wherever the joist spacing is non-standard (such as near windows, doors, or corners), or where there are obstructions in the walls (such as wires, electrical outlet boxes, or pipes). Batts can be installed by homeowners or professionals. They are available with or without vapor-retarder facings. Batts with a special flame-resistant facing are available in various widths for basement walls where insulation will be left exposed. Blown-in loose-fillinsulation includes cellulose, fiberglass, or rock wool in the form of loose fibers or fiber pellets that are blown using pneumatic equipment, usually by professional installers. 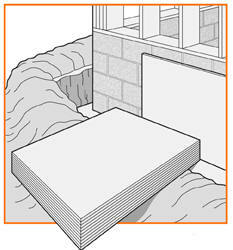 This form of insulation can be used in wall cavities. It is also appropriate for unfinished attic floors, for irregularly shaped areas, and for filling in around obstructions. In the open wall cavities of a new house, cellulose and fiberglass fibers can also be sprayed after mixing the fibers with and adhesive or foam to make them resistant to settling. 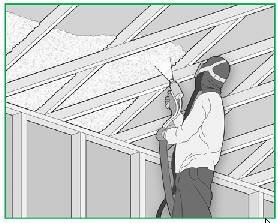 Foam insulation can be applied by a professional using special equipment to meter, mix, and spray the foam into place. Polyicynene is an open-celled foam. Polyisocyanurate and polyurethane are closed-cell foams. In general, open-celled foam allows water vapor to move through the material more easily than closed-cell foam. However, open-celled foams usually have a lower R-value for a given thickness compared to closed-cell foams. So, some of the closed-cell foams are able to provide a greater R-value where space is limited. Rigid insulation is made from fibrous materials or plastic foams and is produced in board-like forms and molded pipe coverings. These provide full coverage with few heat loss paths and are often able to provide a greater R-value where space is limited. Such boards may be faced with a reflective foil that reduces heat flow when next to an air space. Rigid insulation is often used for foundations and as an insulative wall sheathing. Reflective insulation systems are fabricated from aluminum foils with a variety of backings such as kraft paper, plastic film, polyethylene bubbles, or cardboard. The resistance to heat flow depends on the heat flow direction, and this type of insulation is most effective in reducing downward heat flow. Reflective systems are typically located between roof rafters, floor joists, or wall studs. 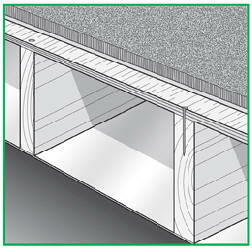 If a single reflective surface is used alone and faces and open space, such as an attic, it is called aradiant barrier. Radiant barriers are installed in buildings to reduce summer heat gain and winter heat loss. In new buildings, you can select foil-faced wood products for your roof sheathing (installed with the foil facing down into the attic or other locations to provide the radiant barrier as an integral part of the structure. 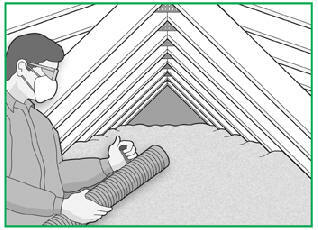 For existing buildings, the radiant barrier is typically fastened across the bottom of joists, as shown in this drawing. All radiant barriers must have a low emittance (0.1 or less) and high reflectance (0.9 or more). -Fiberglass insulation thermal/sound attenuation blanket with an asphalted foil kraft paper facing on one side with stapling flanges at edges. -Fiberglass insulation thermal/sound attenuation blanket with an asphalted kraft paper facing on one side with stapling flanges at edges. -Designed for use where a vapor barrier is required and can be left exposed in low abuse areas. Used for jobs where a flame spread of 25 is required. -An unfaced fiberglass thermal/sound attenuation blanket with no vapor barrier. Designed to fit between studs by friction. -A fiberglass blanket laminated to a reinforced facing which can be left exposed. It is also available unfaced for non exposed areas such as crawlspaces. -A white loose-fill fiberglass insulation. Designed for mineral fiber blowing machines. R-Value and thickness can be determined upon your needs and budget. Visit Sandium.com if you need more information about insulation. 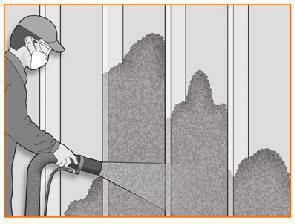 Rigid exterior basement wall insulation can be great because it performs several different functions. Along with insulating the wall, it provides a layer of protection for the exterior waterproofing against backfill materials. If the soil has rocks in it when placed back against the foundation, it can cut through the waterproofing material creating a possible leak in the future. The insulation board provides a "padding" to protect the wall.